This tutorial explains how to export all WordPress URLs in Excel. Export All URLs is a free WordPress plugin which allows you to export all the URLs from your WordPress site. And it can help you do that in an intelligent manner. Here you can choose whether you want to export all the URLs of pages, posts, and other content from your website. 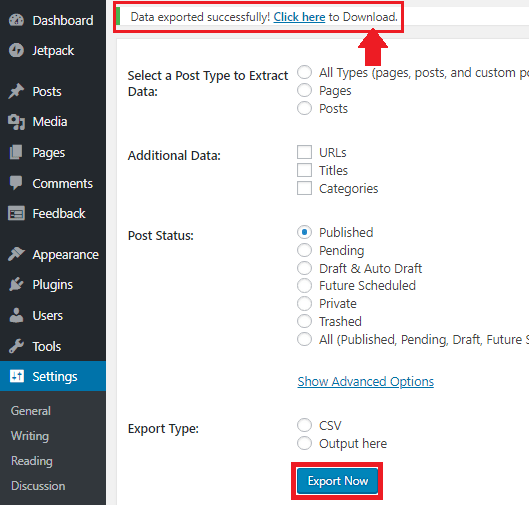 Here it lets you choose whether you want to export URLs of published posts only or you want to include the URLs of posts in Pending or in Drafts. Additionally, you can also opt to add other information in the final file. You can add the post title, category along with the URLs in the final CSV file that you can open in Excel. There can be many use cases of URLs of your website. If you want to test them for broken content or you want to post them on social media then this tool will help you. You just have to specify your preferences for the final file and get all the URLs in CSV file. In just a couple of clicks, you can get the CSV file that you can open in Excel. 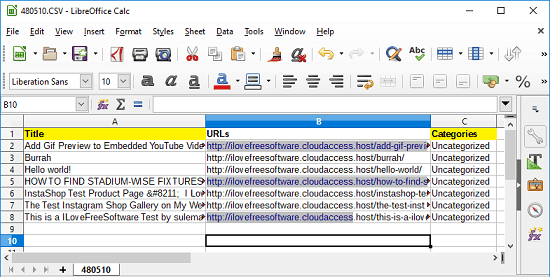 How to Export All WordPress URLs in Excel? If you know how to install and use WordPress plugins to do different tasks then it will be very easy for you. Just get this plugin from here or install it using the Plugins section. Just search for it and then install it. Next, activate it and then start using it. Go to the plugins page from the Settings and then specify what you want to do. You can specify whether you want to download URLs of all the posts or want to exclude the website pages and custom post types. Specify your choices and then specify what data you want in the final CSV file. Finally, click on the Export Now button and on the top side, it will attach a URL that you can click to download the CSV file. After getting the CSV file, you can open that in Excel or in any other Spreadsheet software. You can also convert that CSV file into other formats as well like XLSX, JSON, etc. 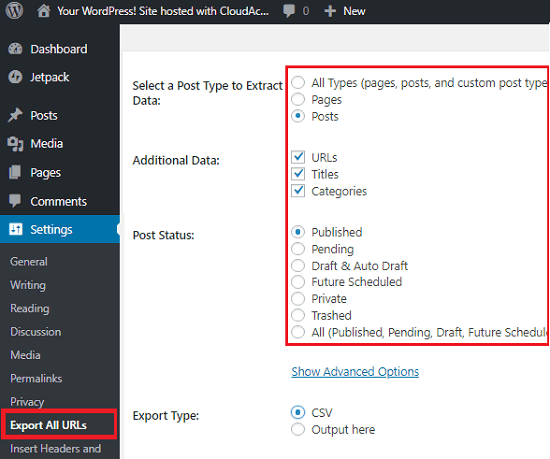 If you have a website running on WordPress, then you can use the Export All URLs plugin export all URLs. You just need a few clicks to specify your preferences and then get the list of all URLs. Export All URLs is really helpful plugin for bloggers or other users to quickly export all the URLs in Excel compatible format. It makes it very simple to download the URLs of published posts, pending posts, and posts in draft.